I recently came across a transcription of a deposition which Theodore M. Berry gave after being subpoenaed for the school desegregation case Bronson v. Board of Education of Cincinnati. During that deposition and much to Berry’s annoyance at what he called the “terrific waste” of everyone’s time and money, lawyers from all sides of the case had Berry go into great detail about many aspects of his life. He told of his time at the Stowe School, he told of his work as a young lawyer and he told of the Tuskegee Airman case. In fact, Daniel “Chappie” James went on to become America’s very first African American Four Star General. 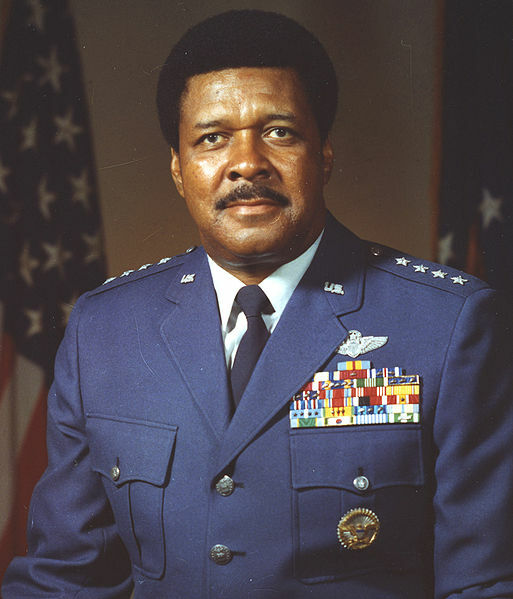 Just after receiving his fourth star in 1975 he described the incident in an article in the Journal Herald called “Black General Fought his Way Up” by William Greider. “I was in the first wave arrested, then we persuaded others. The damn thing started to escalate and pretty soon every black officer in the place was marching on the officers’ club, demanding to be arrested.” Although Chappie was taken into custody initially and was technically “under arrest” until charges were dropped against the 101 officers after the court martial of Thompson, Clinton and Terry, he was released almost immediately because his flying skills were needed. What the military didn’t know was that when Chappie was flying around the United States delivering supplies, he was also getting the word out to the public about how blacks were treated in the US Air Force. In a 1977 interview with Michael Coakley of the Chicago Tribune he said “I’d be flying missions to Dayton or Louisville and while I was there I’d slip over to the newspapers and give them a pile of news releases on what was going on. Boy, they’d have killed me if they’d known I was doing that – with military aircraft.” I don’t think even Berry’s masterful oratory could have gotten him out of trouble if he’d been caught handing press releases to sympathetic newspapers, but that was a risk worth taking for good reason. People willing to take that chance helped change the way the world works. I always love coming across something seemingly small and insignificant, like Berry’s quick mention of Chappie in the quote above, which when followed along its natural route, leads to a great learning experience. And things like that happen so often in the Archives and Rare Books Library.